(26/06/16) In commemoration of the Auspicious Month of Ramadhan, the religious ordinance of The Fast brought together Christians and Muslims in engagement and prayer for peace, faithfulness, adherence to charity, and constancy in virtue and works for humanity. 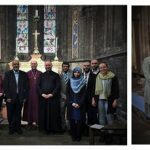 Following the evening service at St Mary’s Cathedral, Edinburgh, Mother Church of the Diocese of Edinburgh, members of the Scottish Ahlul Bayt Society received a blessing by The Bishop of Edinburgh, the Rt Revd Dr John Armes, as insights were shared to the congregation of The Fast. The Bishop spoke of his experience fasting in solidarity with the Muslim community. A reading from the Holy Quran was given, along with solemn words shared on the tragedy of the martyrdom of Imam Ali [ع]. Our sincere thanks extend to the Rt Revd Dr John Armes for the fellowship that emerged from deepening understanding and prayer, and we hope to take forward this blossoming interface.